HD’s House Foundation Repair Process Solves Problems. 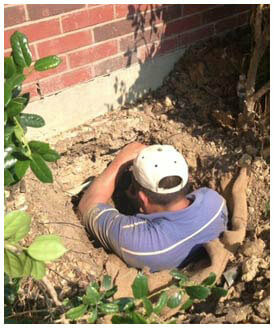 Need Dallas house foundation repair, Fort Worth, Arlington or DFW service? Contact HD Foundations about installing foundation piers. Foundation issues are common in local cities like Fort Worth. House foundation repair in Dallas, Arlington or other metro cities protects your property. Structures in this area are strongly affected by climate and soils. It makes your concrete slab or pier and beam foundation level. It protects your property value. It minimizes safety risks. Uneven foundations are dangerous. Repairs must be made on house foundations before any remodeling takes place. It’s difficult to sell a home that has foundation damage. 3 – The pilings are driven into the ground with a hydraulic ram. They’re installed to what is referred to as “the point of refusal.” In most cases, foundation piers are driven down about about 8-16,’ although they can be placed much deeper. In the event you have a concrete slab foundation and require interior piers, we must crack the slab in order to install them. 4— No matter which type of foundation you have, the lowest point of your house is raised (using hydraulic bottle jacks) in order to restore your foundation to its original position. As part of completing repairs on your Dallas Fort Worth area home, it is positioned on top of these piers. During this step the project foreman will monitor how your house reacts in preparation for lifting. When that task has been completed, 1/4″ steel spacers (foundation shims) are inserted on top the piers. These shims ensure that your foundation is level. 5— Each hole is compacted with soil in order to fill the void created when we prepared the site. Any shrubs that were removed from around your foundation are re-installed and your yard, walkways and driveway are thoroughly cleaned, raked and washed. The property around your house will be tidy when we’ve finished with the project. How Long Does It Take To Repair House Foundations Using Piers? Fixing slab or pier and beam foundations usually take 2-3 days. Re-shim projects are typically done in one day. The time frame can vary depending upon how many foundation piers must be installed. Cracked slab foundations require about the same amount of time to fix as pier and beam foundations. It takes more time to install interior foundation piers than exterior ones. That’s because the installation of interior piers involves removing flooring and cracking the house’s concrete slab in order to get beneath it. To find out more, ask HD Foundations to perform an inspection on your foundation. We serve the entire DFW metroplex, including Arlington, Fort Worth and Dallas. House foundation repair estimates can be scheduled free online today.